This figure is yet another unfinished project from a few years ago. It is a Maurice Corey sculpt and was purchased direct from his web-site. 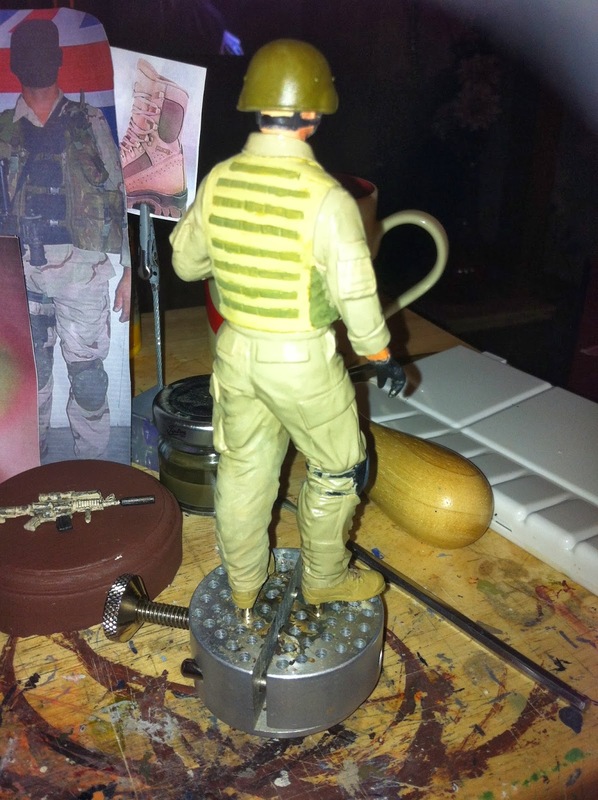 I think that it was a limited edition run and is now no longer available from their website although I have heard that Foxwood figures are selling the figure at the moment I remember putting this figure together and admiring the quality and detail of the sculpt. 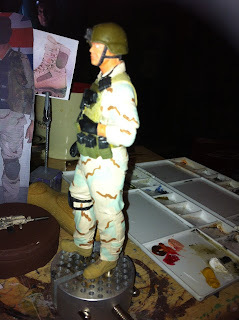 I also remember painting the camo pattern, stepping back and immediately hating it. The figure was put into its box after I had promised myself to return to it soon! 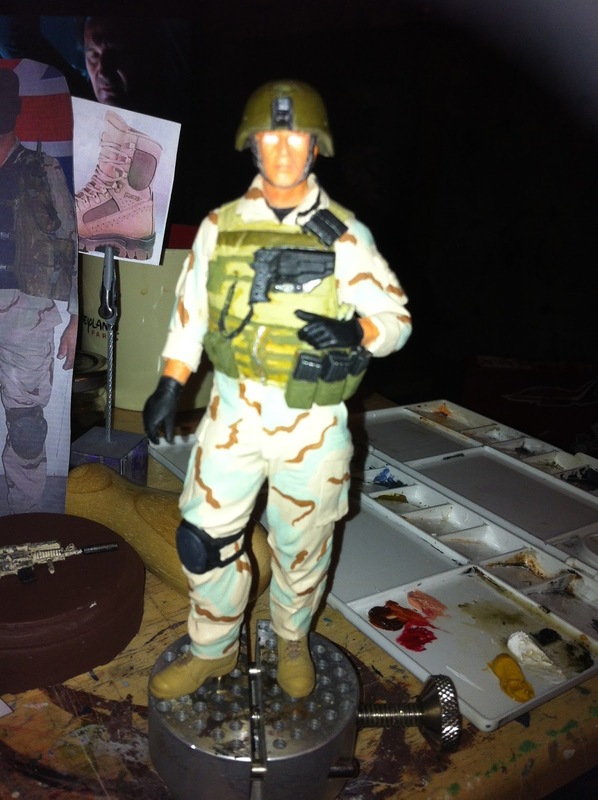 Well its a few years on and after pledging to myself (and my wife) that I would clear the backlog of half finished kits that I have in storage, the SAS figure has made a re-appearance. The first couple of shots show the figure as it was when I brought it out of storage. 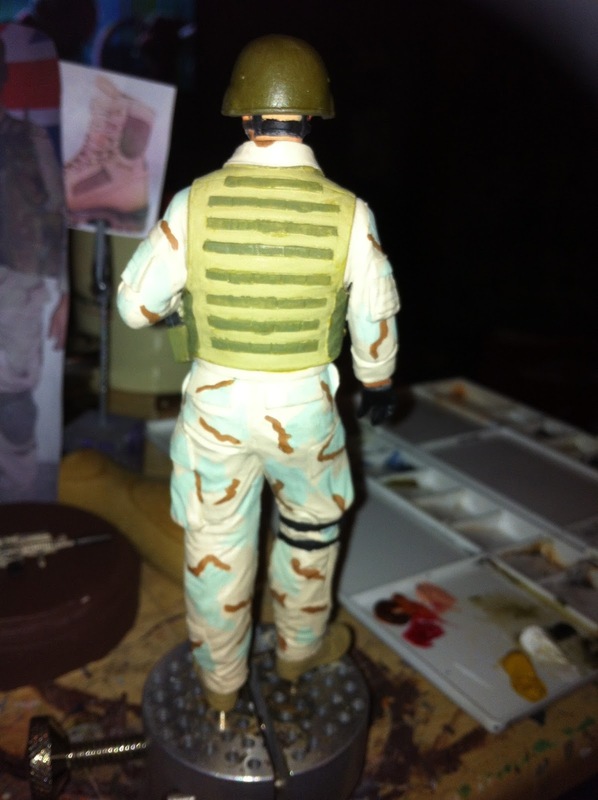 The camo pattern on the uniform is accurate for the SAS troopers of this period, but I just didn't like it on a scale figure; the blue was too blue and the brown to bright. for my taste. 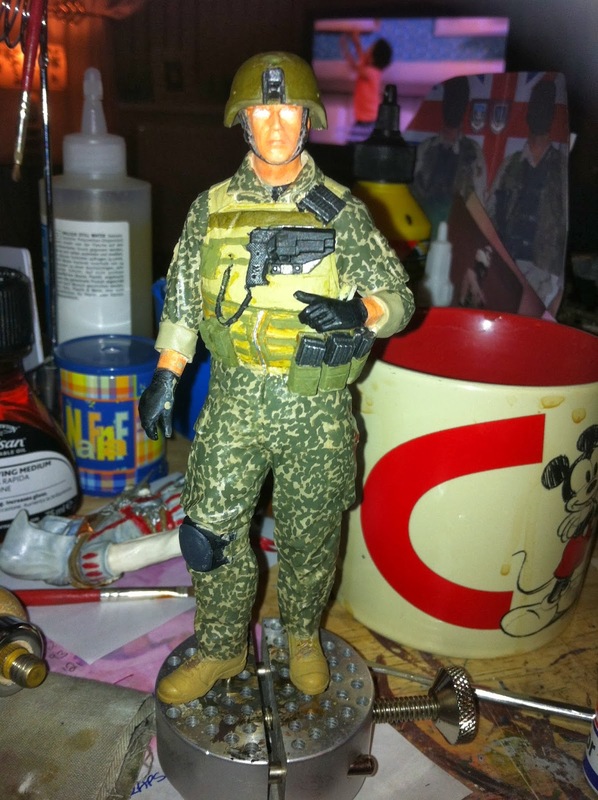 I decided to take a fresh approach on this figure and opted to apply a completely different camo pattern than I had used in the first instance. I have a couple of reference shots that were downloaded when I first started this figure. 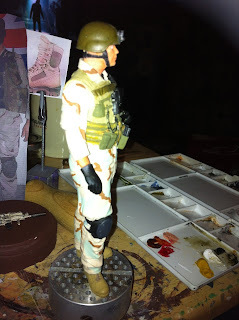 In one of the photos is a different camo pattern that I think will translate really well on this figure. 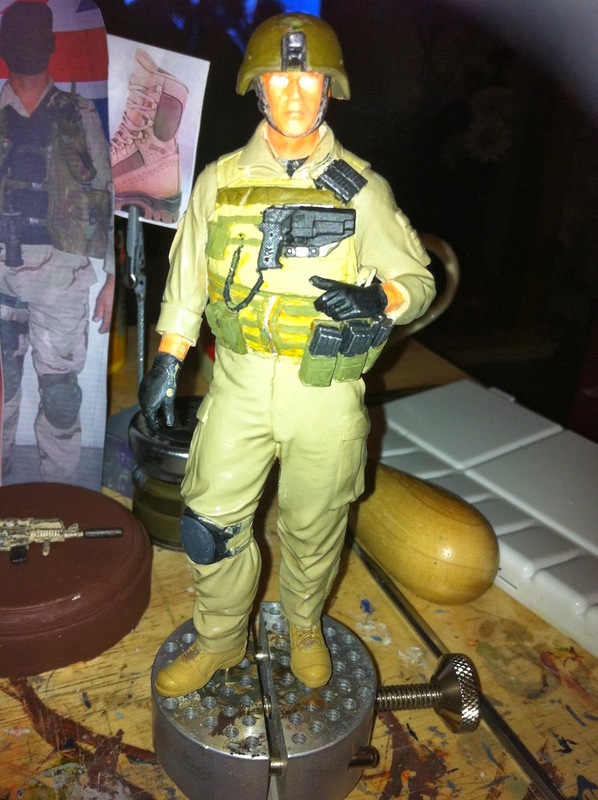 I will state for the record that the figure is based on images from an internet source and can say that I am 90% convinced that the reference shots I used for this figure are indeed of SAS troopers, however they may be photos of Australian SAS rather than British SAS troopers. 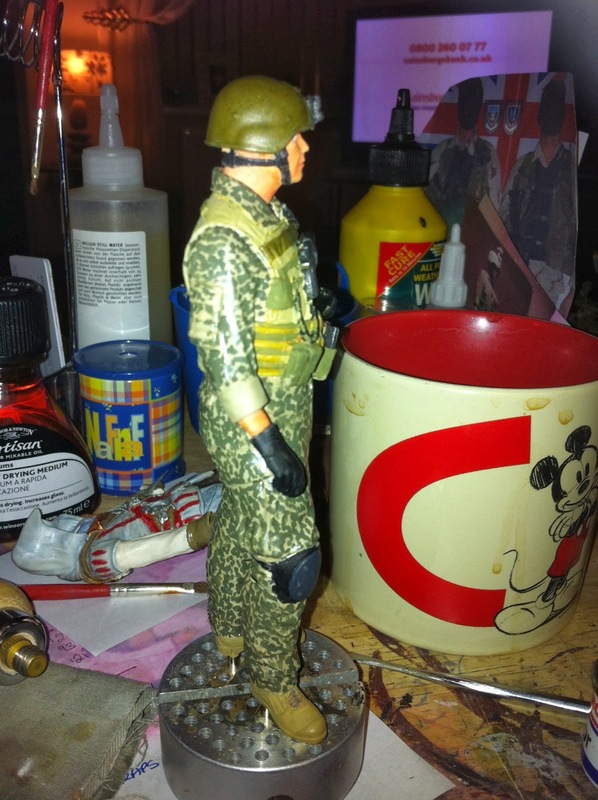 For this reason I have given this particular figure the generic title of "modern SAS trooper". 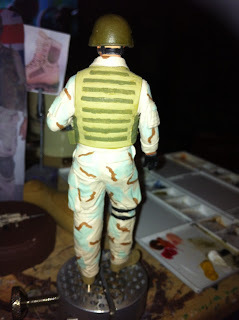 The base coat applied for the new camo pattern is a light humbrol enamel brown followed by humbrol dark green for the over printed pattern which is essentially a series of small circles that overlap one another. Looking at the new colour I am now kicking myself for not choosing this pattern the first time around, but hindsight is a wonderful thing I suppose. 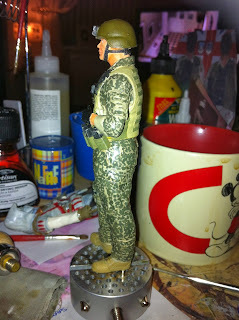 The next couple of shots are of the figure in the base colour followed by the camo pattern. As yet I have not began shading or highlights in oils nor have I finished any particular area of the figure so things are a little " rough around the edges". The next stages for this figure I think will be a complete tidy up of all edges with a very steady hand and a 0000 brush followed by some shading and highlights with oils. I decided to keep the base as simplistic as possible for this figure. 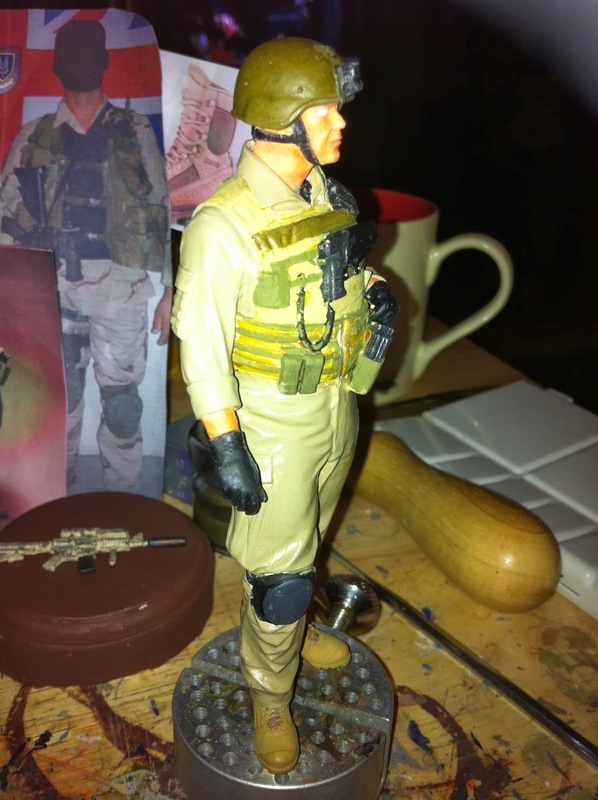 Being as he is a representation of modern special forces, it would be a good assumption that he would have been photographed in a modern theatre of war, the most frequently photographed being Afghanistan. The base the figure will be mounted onto was the smallest one that I have and I added a\ large chunk of dried tree bark which looks very similar to sandstone when stood next to a scale figure. 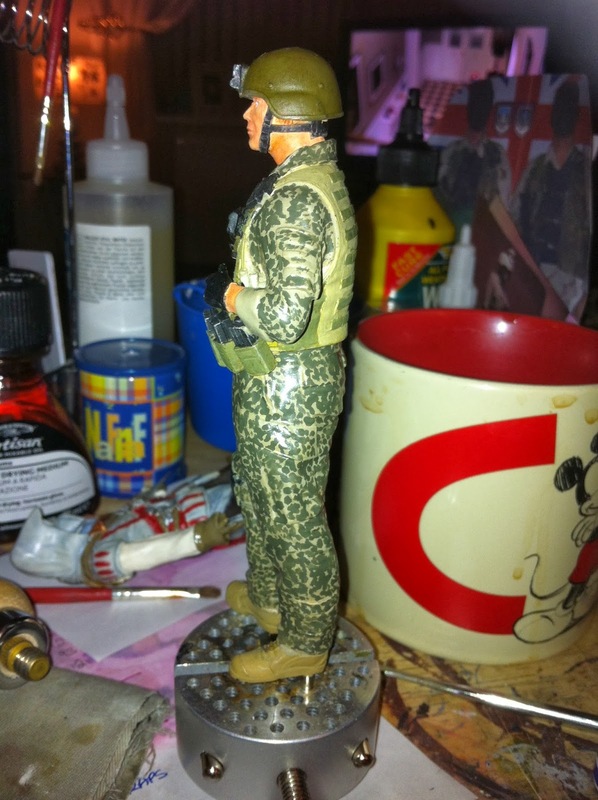 The chunk that I chose takes up at least half the base area, leaving a small area in front of it for the figure to stand. This was covered in Javis brown scatter as an undercoat, followed by some "budgie grit" which hopefully represents the rough landscape of Afghanistan well. 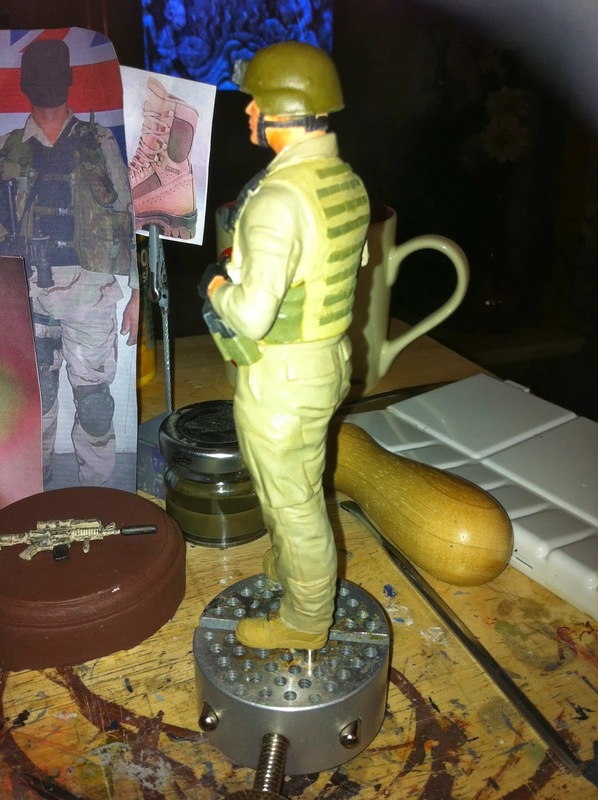 For a little more interest I also decided to buy a small SAS pin badge from e-bay which I intend on mounting to the base to provide a little more interest to the finished piece.